Lombok, January 30th 2015 – Archipelago International’s popular select service hotel brand, favehotel, is making its debut on the flourishing island of Lombok with the opening of the favehotel Langko Mataram – Lombok presenting a vivid alternative for business and leisure travellers seeking a reasonably priced, yet modern, comfortable and professionally managed hotel. With Mataram being Lombok’s commercial center and seat of government, the hotel aims to bring a breath of fresh air to Lombok’s limited choices of business traveler focused accommodations offering 117 functional and modern guest rooms in the for favehotels typical edgy and cheerful design, 4 meeting rooms, ample of parking space, an eclectic café shop / restaurant and of course as in every fave, truly high speed, complimentary and reliable Wi-Fi throughout the entire property. “favehotels has gone from strength to strength over the years winning numerous award and accolades as Indonesia’s most popular budget hotel brand. 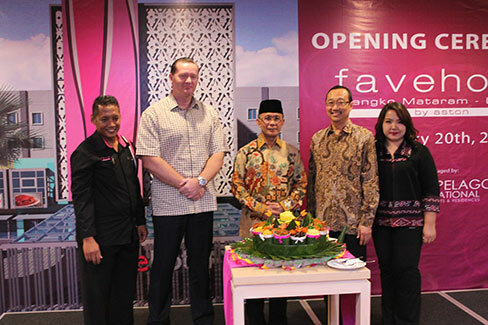 We are delighted to be marking yet another milestone with the opening of our first fave in Lombok which is also the first international standard select service hotel on the island.” Said Norbert Vas, Archipelago International's VP Sales & Marketing. favehotels currently operates 32 hotels in Indonesia and 1 in Malaysia on the popular resort island of Langkawi and has a large development pipeline in Indonesia, Malaysia and the Philippines. favehotels recently won the “Indonesian Best Budget Hotel Chain Award” and aims to be Indonesia’s best in class, largest and most consistent budget hotel chain promising uncompromising standards for cleanliness and safety, with a network covering the entire archipelago. The group has announced plans to open more than 30 new hotels within the coming 2 years. Archipelago International is one of Indonesia’s leading hotel operators with an underlying portfolio of more than 90 hotels and 12,000 rooms. As a continually expanding brand, Archipelago International has a development pipeline exceeding 100 properties in Indonesia, the Philippines and Malaysia.